We have released a new major version of novaPDF, 9.0, which contains important features, updates and fixes. This is a new version with important features and updates thus we highly recommend the upgrade. You can download it here: Download novaPDF. Upload to FTP/SFTP (PRO only). 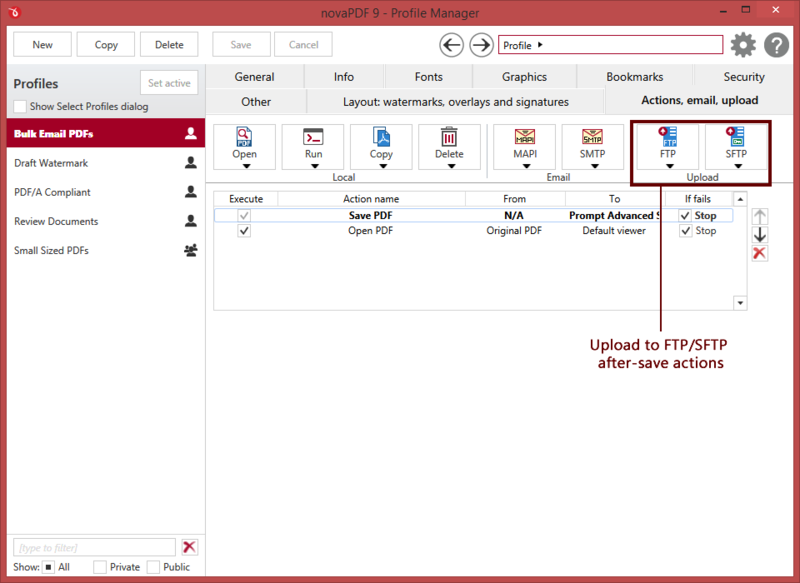 You can configure novaPDF to upload the generated PDF file (or a custom PDF) to an FTP or SFTP server. You can define different FTP/SFTP presets and add as many after-save actions as needed, in the order that you want them to run. Printer Monitor tool. 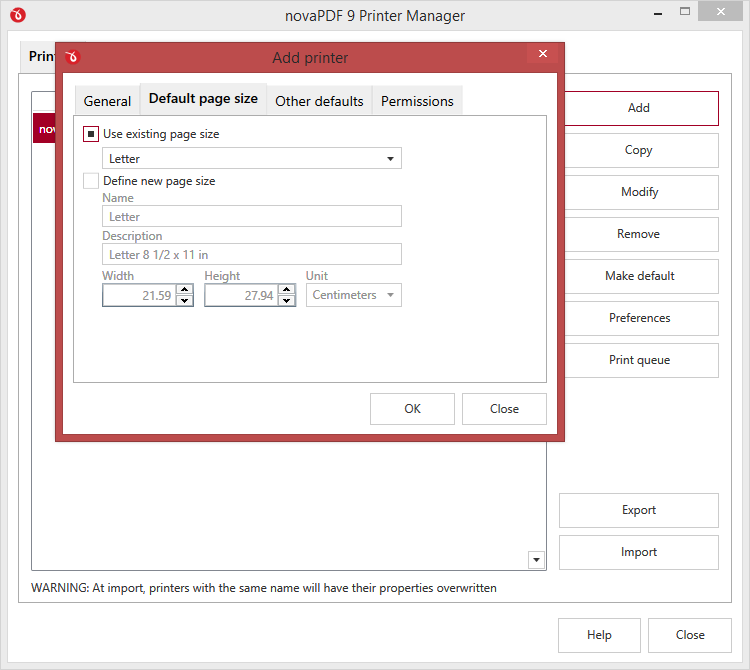 novaPDF 9 includes a new print job monitoring tool, available in all editions. 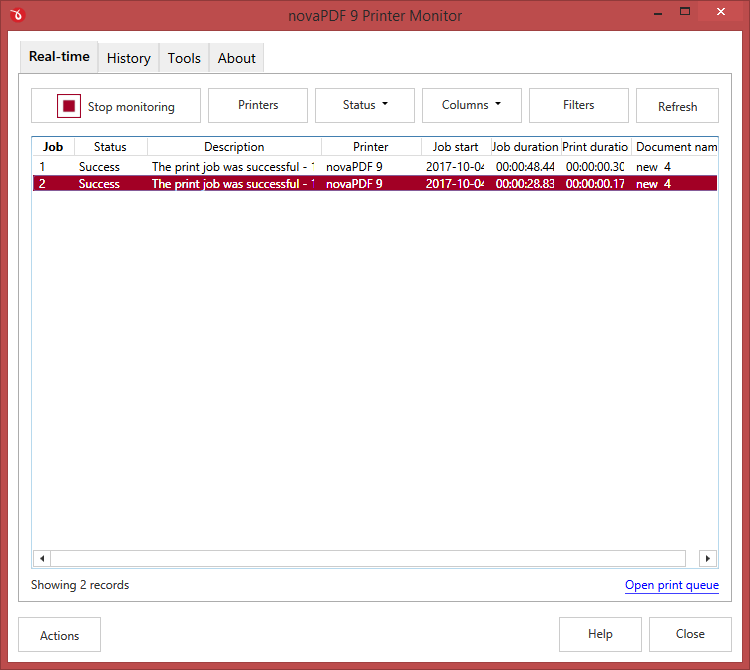 This tool allows monitoring in real-time all the printing jobs that go through novaPDF’s printer driver. You can use multiple filtering/sorting options and access the print queue. This is useful especially for network admins that want to monitor the novaPDF printing activity. 128 and 256-bit AES encryption (PRO only). Older versions of novaPDF had support only for RC4 encryption, but starting with version 9 novaPDF Pro has support for 128 and 256-bit AES encryption as well. This allows you to protect your PDF documents with the strongest encryption type available. Predefined actions to Open/Run/Copy/Delete. The after-save action section was redesigned and now all editions also include 4 new types of actions. 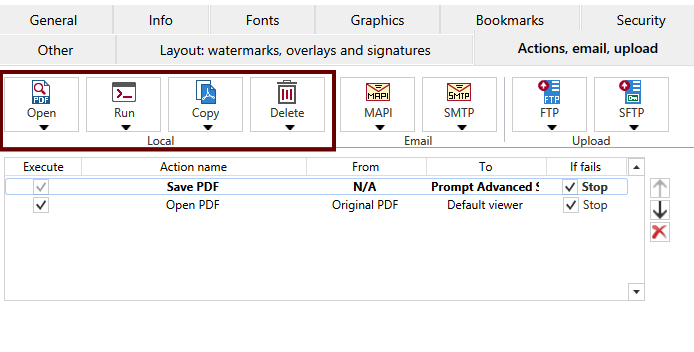 You can set after-save actions on how to open the resulting PDF, copying it, run a particular application or even delete the PDF. Set/Edit Copyright Information (PRO only). From the Info section you can now choose to add new extended metadata information. Up until now you could set only the regular metadata information (subject/title/author/keywords), but starting with version 9 you can add copyright information or custom data. Printed documents history. 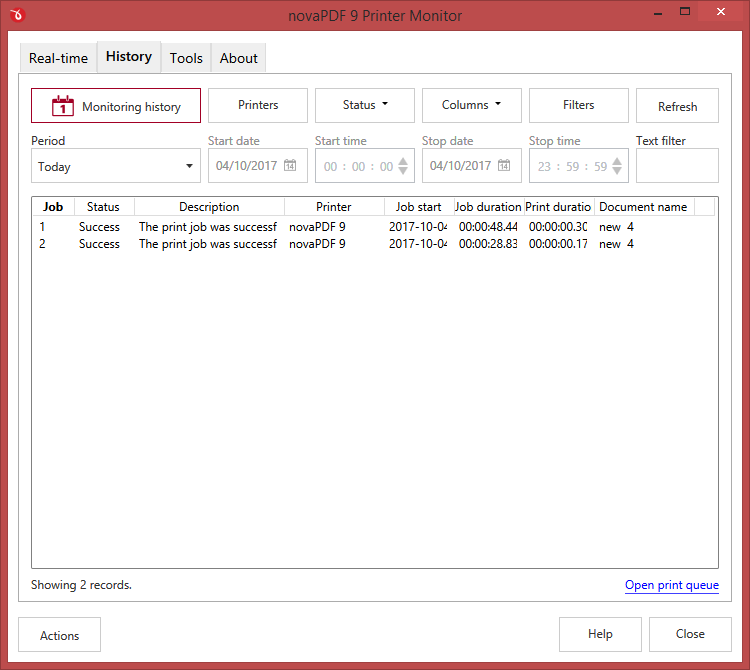 The printer monitor tool will capture in realtime all printing job information. You can also keep those job monitoring logs in a filterable History section to access them later. Add printers with different defaults. 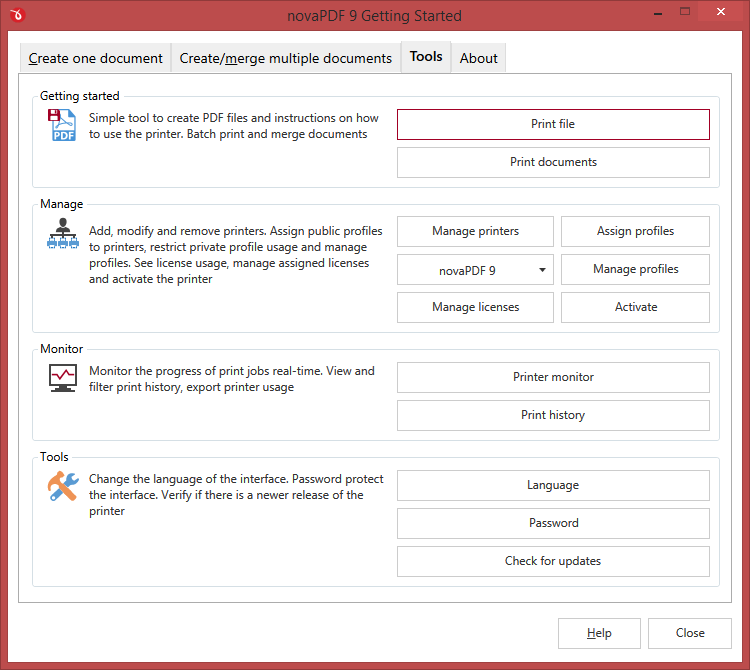 You can use the printer manager (available in all editions) to add regular/shared printers and set different default values for paper size, orientation, resolution, copies, scaling as well as end-user permissions. Design changes. Several sections of novaPDF were redesigned and re-structured for better usability. This includes a brand new Tools section with quick access to the most important novaPDF tools. Notice to previous versions users (novaPDF 1.x – 8.x): novaPDF 9 will be installed separately and allows you to test it before deciding to buy the upgrade.